Titanic Museum Attraction is a tribute to Titanic’s ship, passengers and crew! it is said, the best way to respect and honor those who gave their lives is to simply tell their stories. Welcome Groups! The World’s only Permanent Titanic Museum Attraction is anchored right here in Pigeon Forge, Tennessee. Our museum provides visitors with the ultimate Titanic experience the moment they step aboard the massive, ship-shaped structure. For two hours, guest passengers will be swept up in the excitement, wonder and consequences of the Titanic story. 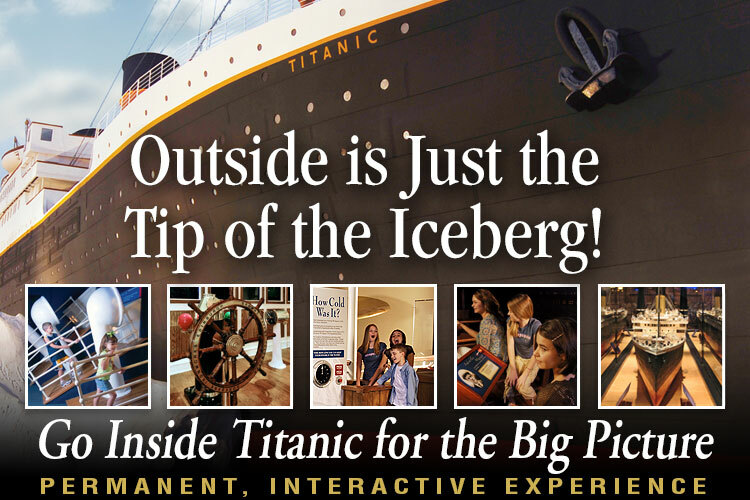 See More than 400 priceless artifacts and treasures on two decks, walk the Grand Staircase, sit in a full-sized lifeboat and hear actual survivor stories, touch an iceberg, and more. Book your 2017 Titanic Tours Today by calling 800-381-7672! We are confident that our museum attraction will provide a great compliment to any group itinerary! Call (800) 381-7672 for reservations!